Non-accidental injury (NAI) is a common differential diagnosis in children presenting with unexplained fractures. Multi-agency investigations and strategy meetings are completed at hospital, and although necessary, can create anxiety and stress for the family. Differentials such as osteogenesis imperfecta and rare neuropathies are additional possibilities. 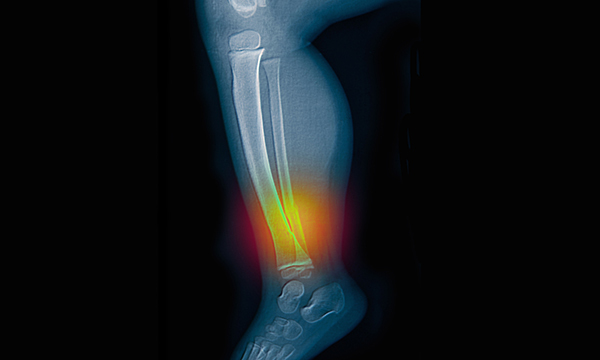 This case study presents a two-year-old admitted via the emergency department (ED) with right tibia and fibula fractures. Additional concerns included marked tenderness and calf swelling with no mechanism of injury witnessed by either parent. Discussions with consultant radiologists specialising in children’s safeguarding suggested significant force from a direct anterior or posterior blow would have been required. Child protection proceedings were commenced. On discharge, the child and younger sibling were initially placed by social care with a family friend under a working agreement. Serial outpatient X-rays were undertaken. Two months post-discharge the child was readmitted with concerns about continued NAI due to radiological worsening of the initial fracture line. However, these concerns were called into question when continued worsening periosteal reaction was seen on X-ray despite admission to a place of safety. The child was born at term via caesarean section for breech delivery to consanguineous Pakistani parents. A systematic history and examination identified eczema and loss of the tip of tongue from biting (requiring maxillofacial involvement) as well as healed finger lacerations. The child was fully mobile but displayed challenging behaviour with cognitive and language delay. No neurological abnormalities were identified on examination. Parents commented the child did not appear to feel pain; this was confirmed by healthcare professionals during vaccinations. Though the family was considered vulnerable, no concerns had been raised by primary or secondary care professionals and multiple outpatient appointments (maxillofacial, dental, paediatric) had been attended. Preliminary standard investigations undertaken on each admission detected only a raised alkaline phosphatase and displaced transverse fractures through the right mid-diaphysis of both tibia and fibula with anterior soft tissue swelling. Cytogenic test: molecular investigations for hereditary sensory and autonomic aeuropathy (HSANs) showed homozygous mutation of the NTRK1 gene confirming HSAN IV or congenital insensitivity to pain syndrome, one of five recognised HSAN subtypes. This extremely rare autosomal recessive condition is characterised by the absence of pain and temperature sensation, anhidrosis and mental retardation. Patients also suffer from oral mutilation, fractures, bruises and ulcerations of extremities secondary to pain insensitivity due to abnormalities in peripheral nerves. This case illustrates the difficulty in differentiating NAI from congenital insensitivity to pain syndrome. While child abuse should always be considered, practitioners should be mindful of rarer disorders such as congenital insensitivity to pain syndrome. It should also be acknowledged that children with congenital insensitivity to pain syndrome can also be victims of child abuse. Akhaddar A, Malih M (2014) Neglected painless wounds in a child with congenital insensitivity to pain. Pan African Medical Journal. 17, 95. Dwek J (2011) The Radiographic Approach to Child Abuse. Clinical Orthopaedics and Related Research. 469, 3, 776-789. Klein C, Wu Y, Kilfoyle D et al (2012) Infrequent SCN9A mutations in congenital insensitivity to pain and erythromelalgia. Journal Neurology, Neurosurgery & Psychiatry. 84, 386-391. Ma A, Turner A (2012) A life without pain: congenital insensitivity to pain due to compound heterozygous SCN9A mutations. Journal of Paediatrics and Child Health. 48, 3, 285-286. Makari G, Carroll J, Burton E (1994) Hereditary sensory neuropathy manifesting as possible child abuse. Pediatrics. 93, 5, 842-844. Spencer J, Grieve D (1990) Congenital indifference to pain mistaken for non-accidental injury. The British Journal of Radiology. 63, 748, 308-310. Van den Bosch G, Baartmans M, Vos P et al (2014) Pain insensitivity syndrome misinterpreted as inflicted burns. Pediatrics. 133, 5, 1381-1387. Heather McMillan is an advanced paediatric nurse practitioner at The Mid Yorkshire Hospitals NHS Trust, on behalf of the RCN’s Research in Child Health community. Acknowledgement: The author would like to thank supervisor Dr Zahir, consultant paediatrician at Sandwell and West Birmingham Hospitals NHS Trust.